Where did People Come From? Consider the Lovely Ladybug. Ladybugs, evolution and creation are the themes that Jean B. Cly combined in this gorgeous basket she brought into Twin Rocks. 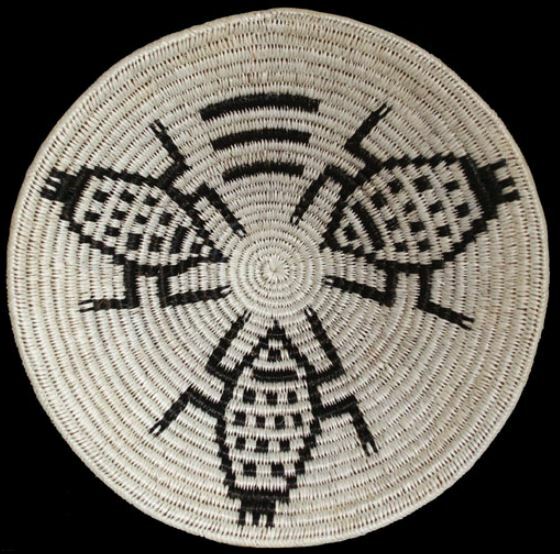 Navajo people believe that, in their earliest forms, they were ants and various bugs. Through the past four worlds they have changed into the people-animals that they are today. Through her weavings Jean has led us, and taught us, many of the traditional Navajo legends and stories. Wonderful stories that make our world expand and teach us the possibilities of our imaginations and beliefs. We believe learning different stories makes us better people. That it makes us more compassionate beings as we walk this earth we all share. Thank you, Jean, from the crew at Twin Rocks!